Inspector Tyador Borlú of the Extreme Crime Squad finds deadly conspiracies beneath a seemingly routine murder. From the decaying Beszel, he joins detective Qussim Dhatt in rich vibrant Ul Qoma, and both are enmeshed in a sordid underworld. Rabid nationalists are intent on destroying their neighboring city, and unificationists dream of dissolving the two into one. 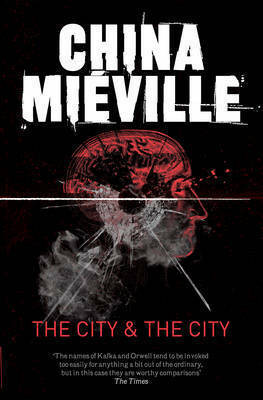 I have thoroughly enjoyed all the Miéville books I have read so far and I had started to feel a withdrawal from his writing but wanted to read one of his shorter books so thought I’d give The City and The City a go. It seems that every Miéville book has a different writing style while at the same time still being recognisable as being by him. This book is a crime mystery, more speculative fiction than science fiction I would say but still elements of the unusual. This book is more political which I really got in to. At the beginning, I wasn't sure exactly what was going on with the two cities: Ul Qoma and Beszel. I was very intrigued and I had to keep reading and things then started to fall in to place. It’s hard for me to give a rundown on this book without giving too much away but basically a woman is found dead in the back of a van and a Detective from Beszel's Extreme Crime Squad is sent to investigate it but he quickly finds himself wrapped up in red tape and politics as it’s not a straightforward murder. This story is complex! It needs your undivided attention at all times but it’s worth it! Such a creative idea for a setting and the way it was written, the two cities almost became characters all of their own. The last quarter of the book was tense and I couldn't put the book down. I think I would have enjoyed it more if I could have read it consistently but part way through the book I had to take part in a reading challenge so I put it aside to read another two books then came back to this one. Still a 5 star read though!